The new FC Barcelona second strip for the 2017/18 is now on sale! 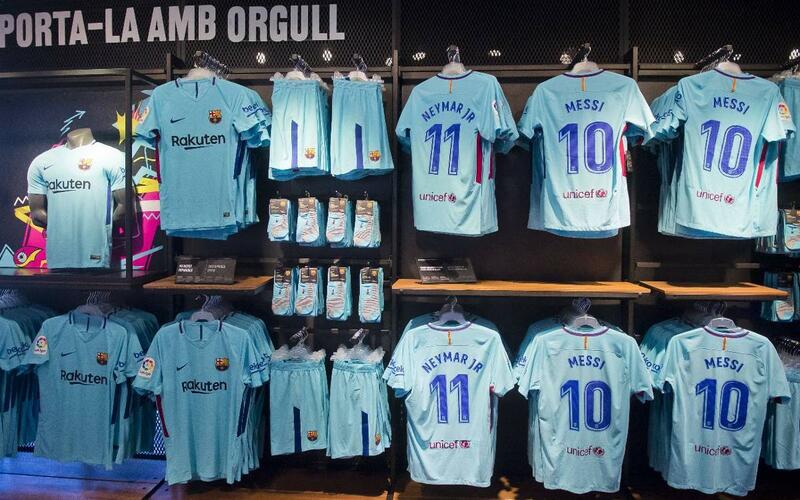 From today July 1, fans can pick up the new light blue design from Nike.com/FCB and any club stores and distributors. Naturally, the front of the shirt features the name of Japanese company Rakuten, whose sponsorship deal with the club officially comes into effect today as well. The shirt’s primary color is a vivid, polarized blue, with detailing inspired by the club’s history and culture on the collar, which is partially defined by the Catalan flag, the Senyera. On the inside of the shirt the word “Força” on the inner right sleeve and “Barça” on the left remind of inner club pride. The sides of the kit feature a dark red or blue stripe on the left and right hand side respectively, running the length of the shirt and blue shorts. Expanding when the player is in motion, the stripe maximizes ventilation. Blue socks, incorporating Nike Grip technology, feature “Barça” on the front in the contrasting darker red shade, and a distinctive graphic on the back of the calf, showcases the club’s blue color and accentuates speed.